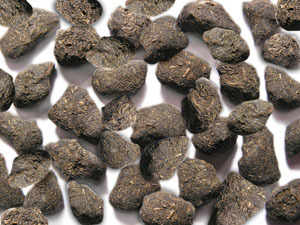 Well-known krupnolistovy the semi-fermented Chinese tea oolong tea (oolong, oolong) in the form of lumps from tea leaves. This turquoise tea with addition of powder of a natural ginseng is produced: the fresh ginseng is dried up in the sun and milled in powder which is added to a tea leaf. The ginseng is well-known the medical and toning properties. Color of infusion - dark-peach, aroma bright, sweetish and fresh. Taste at this unique turquoise tea (oolong, oolong) spicy, flower, with honey and peach shades and sweetish malt aftertaste. 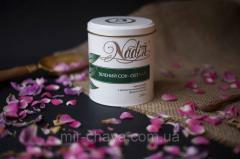 Tea "A ginseng oolong tea" differs in the expressed invigorating effect, well warms and gives feeling of comfort. 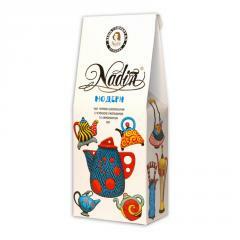 Unbelievable price on Tea Ginseng oolong tea, in Kiev (Ukraine) company Tibest lyuks, OOO (Nadin, Nadin TM ).